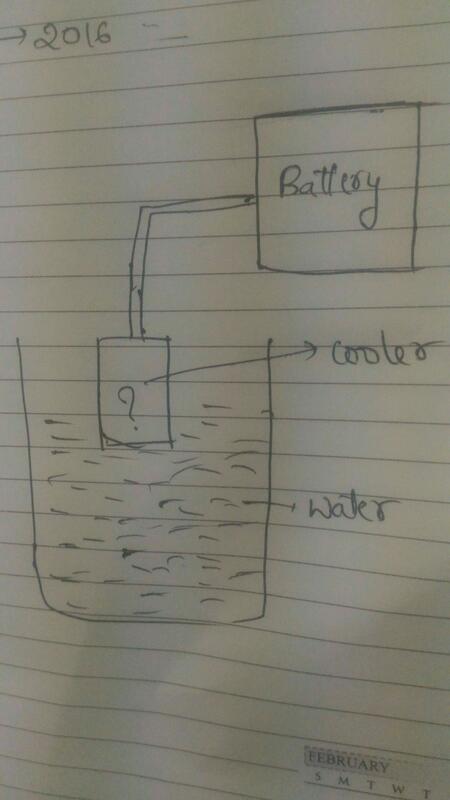 I want to design a component which cools the water in the absence of ice cubes,fridge etc.. Like water heater which works by electric supply.. Similarly water cooler which is independent of electricity. So the material we are using to cool the water should absorb heat as well as it has to transform it to electric form (which is given to battery). This is the "party boat" concept. It's impossible to implement with just the water, the device, and the battery because you'd have to destroy entropy (which is forbidden by the Second Law) when you try to turn the thermal energy into an equal amount of electrical energy. However, you could use a thermoelectric generator between your water and a colder reservoir elsewhere. In this case, the entropy would be transferred to the cold reservoir, and the limit of cooling for your water container would be (in the best scenario) the temperature of the cold reservoir. Not the answer you're looking for? Browse other questions tagged thermoelectricity or ask your own question. Why do we have to compute maximum safe current through resistor equalizing heat exerted by the resistor and heat created in resistor?